We who are Independent Representatives with Enagic, the Kangen Water Company, wait ALL YEAR LONG for this date. 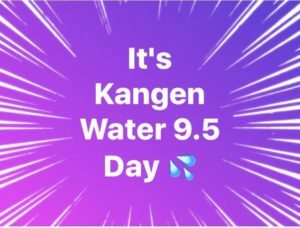 9.5 is the Kangen Water level that many of us drink on a daily basis and September 5th is our 9/5 date of Celebration. If you have not experienced Kangen Water for yourself yet, now is the time. With the news media sharing about the detrimental effects of plastic on our health and our environment, it is a relief to know that our Kangen Water devices offer unlimited supplies of this truly delicious and health-filled beverage. Please connect with me via my website and we can discuss one of my favorite subjects and then you, too, will be Celebrating 9.5 Day with all of us.